MUP successfully launched the first Egyptian human insulin vial with American Standard and international technology produced from (MUP- TECH) Factory and with the brand name Insulinagypt. MUP recently acquired human insulin (Vial) factory of American company Eli Lilly and Company in the sixth of October, which is one of the five factories for the production of human insulin owned by Eli Lilly worldwide and changed the name of the factory to (MUP- TECH). • Insulinagypt 70/30 Vial (4ml /10 ml). • Insulinagypt R vial (4ml /10ml). • Insulinagypt N vial (4ml /10ml). And also a conference was held to announce Insulinagypt launch in the Egyptian market with the participation of a group of senior professors of endocrinology in the presence of Managing Director of MUP and the participation of marketing, scientific office and medical department of MUP. She talked about the latest statistics of the Egyptian and global projection of diabetes epidemiology in Egypt and all over the world and latest guidelines for treatment of diabetics and how to make use of them for better control of diabetes. He talked about the importance of the presence of Egyptian insulin with international quality (Insulinagypt) from MUP TECH Company and its importance for the Egyptian diabetic patient. 3. Prof. Dr. Atef Bassiouni (head of internal medicine department in National Diabetes Institute). He presented the best way for insulin dose preparation and injection for diabetics and problems that must be avoided when using insulin. He spoke about diabetes and progression of the disease, how to treat it and the importance of the presence of Egyptian Human insulin vial with international quality (Insulinagypt). 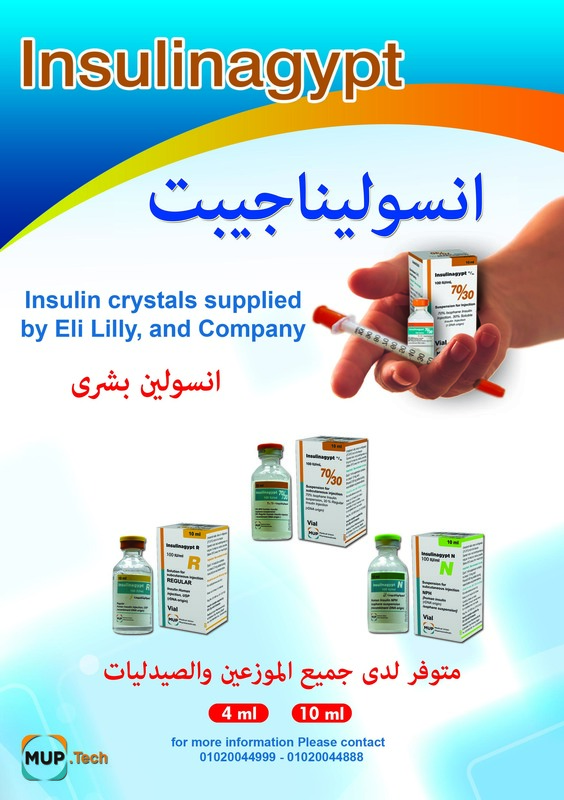 Insulinagypt Vial is now available in all pharmacies and branches of distributers: UCP, Pharma Overseas, Multipharma, Ibn Sina, as well as Egydrug.